Instantly access cable identifiers to create and print labels on the spot. Cable identifiers and test results for each project are centrally stored so they can be accessed and used multiple times. Electrical construction and engineering contractors can now meet multiple project needs for cable ID by inputting data only once. Dramatically improves jobsite workflow, speeds up cable label creation, and helps eliminate transcription and human error. In the office, the project manager uses CAD to plan the network infrastructure, then uploads cable ID and component identifiers to LinkWare Live. 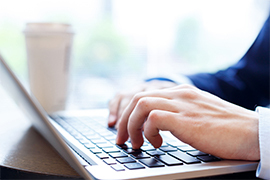 The project manager can use LinkWare Live to define detailed test settings for the job. 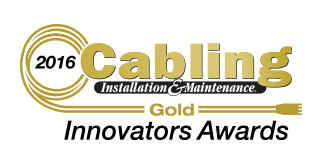 Technicians download and install the LabelLink app to their mobile device. On the jobsite, the contractor or technician uses their mobile device to download cable identifiers from the LinkWare Live cloud directly to the PT-E550W labeler. What are Brother LabelLink and iLink&Label? 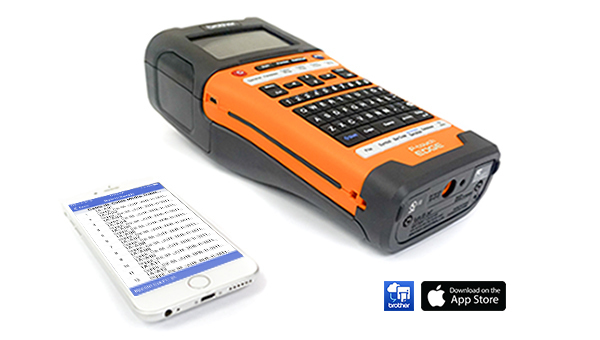 Both are a productivity and quality improvement mobile app solution for cable installers using Versiv testers and Brother PT-E550W label printers. The same mobile app goes by either name depending on the country. This mobile app is an integrated cloud-based solution for managing the test and labeling processes, results and assets. Use of this Brother mobile app with LinkWare™ Live bridges the gap between the office where the project originates, and the jobsite where the project data are needed in the testers and labeling tools. What are Fluke Networks and Brother announcing? Fluke Networks and Brother are announcing an exciting new technology for cable installers to enhance jobsite productivity and quality using Versiv™ testers and the Brother PT-E550W industrial labeler. 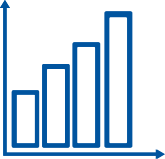 Specifically, it is an integrated cloud-based solution for managing the test and labeling processes, results, and assets. Brother’s LabelLink and iLink&Label mobile apps paired with LinkWare Live bridges the gap between the office where the project originates and the jobsite where the project data is needed with regard to testers and labeling tools. A project manager creates a project in LinkWare Live while in the office. Technicians can access LinkWare Live while on the jobsite and download project data directly into Fluke Networks Versiv testers. Test results are then uploaded into LinkWare Live and recorded into the project database. 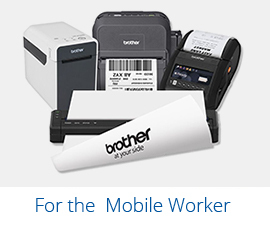 The Brother mobile app will access LinkWare Live, including project data uploaded from the tester, and download wirelessly through a tablet or smartphone to the Brother labeling tool model PT-E550W, which acts as a database. From the PT-E550W, project data is searched and inserted individually or in groups into labels designed for cables, patch panels, and faceplates. Where do I get the app needed to make this work? Access LinkWare Live at linkwarelive.com. Both Brother apps and LinkWare Live are free. What platforms are supported by the Brother app? LabelLink is available in both Apple iOS and Android versions in the US only. Outside the US, LabelLink and iLink&Label are only available in iOS versions – visit your country’s Apple App Store to download either mobile app. 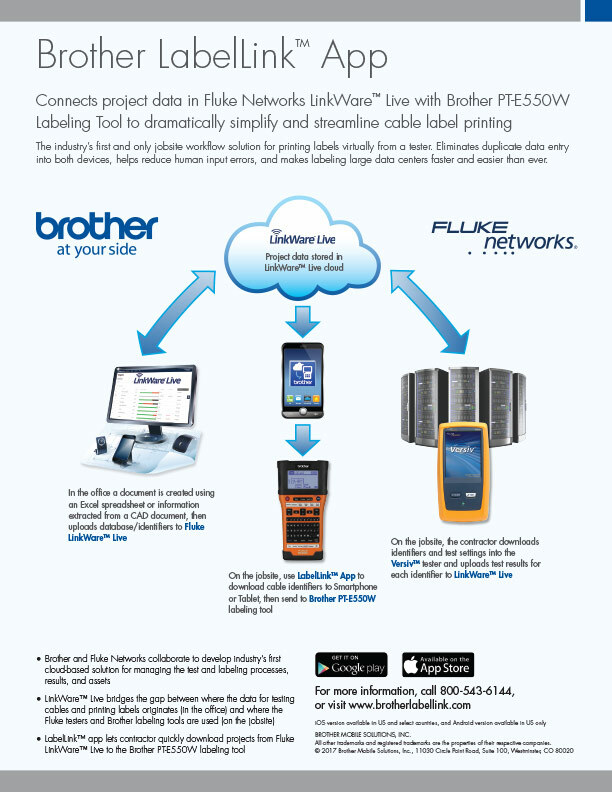 What Fluke Networks products do the Brother apps work with? 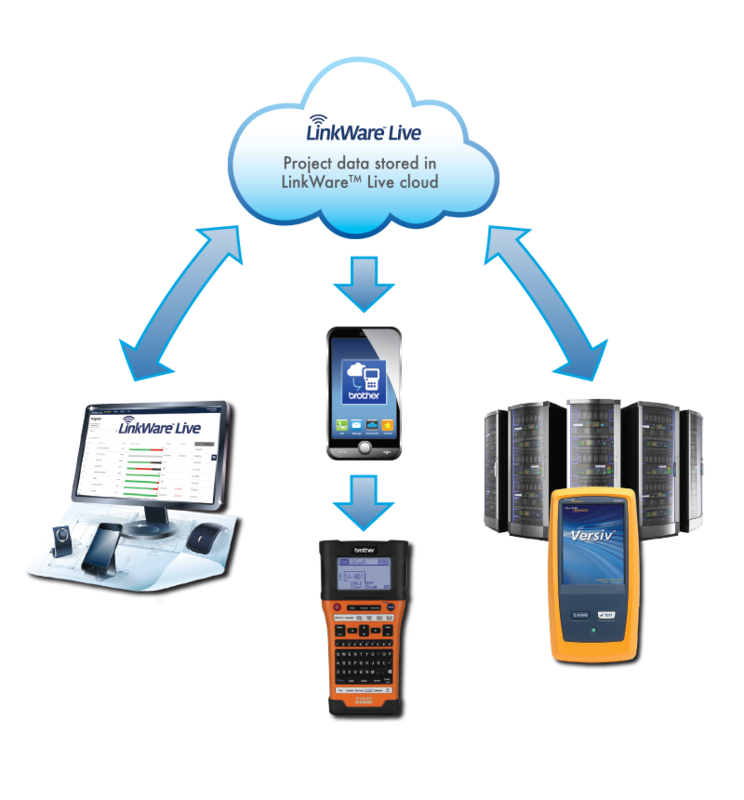 LinkWare™ Live and all Versiv™ models. What Brother products do the Brother apps work with? The Brother LabelLink and iLink&Label Apps work with the industrial handheld labeling tool model PT-E550W. What kinds of labels can I print? Polyester laminated labels for cables, patch panels, and faceplates. Can LinkWare Live help me automate creating the list of identifiers? 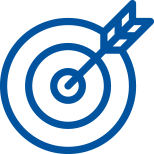 Yes, both Versiv and LinkWare Live allow you to automate the creation of groups of identifiers by entering the first and last ID of the group. LinkWare Live will then fill in the intervening values. 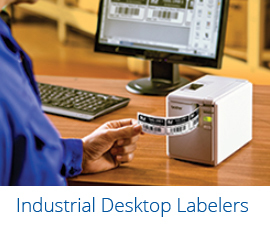 LabelLink was designed to work exclusively with the EDGE PT-E550W industrial labeler. Ideal for complex IT network projects, the PT-E550W can wirelessly print wider labels (up to 24mm wide) ‒ including heat shrink tube anytime, anywhere, on any device. LabelLink is the result of a collaboration between Fluke Networks and Brother Mobile Solutions to marry industry-leading testing and label printing technology to create the new standard in datacom testing and labeling. “This solution was created by two great brands combining their technologies to make network wire, cable and component testing, and labeling faster and easier than ever before. 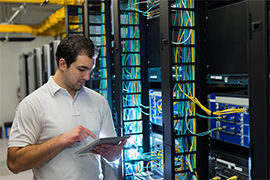 It’s a real game-changer, especially for contractors engaged in standards-based labeling of large and complex datacom installations. Our Brother Mobile team is thrilled and excited to partner with Fluke Networks to introduce the LabelLink application to the world.” Visit Dave Crist's blog. What if you could print cable and ID labels directly from data generated as part of your testing process? 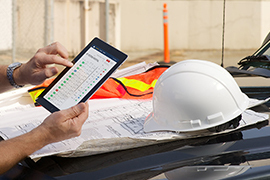 Learn about all the features of LabelLink and how to use them to improve your specific jobsite workflow and cable management goals.